Abstract: The Nicole Elise Boulanger Collection contains material related to Nicole Boulanger, one of the 35 students killed in the bombing of Pan Am Flight 103 while returning home from study abroad through Syracuse University. Nicole Elise Boulanger, a musical theater major in her senior year, was returning home for Christmas after studying on scholarship in London through Syracuse University. 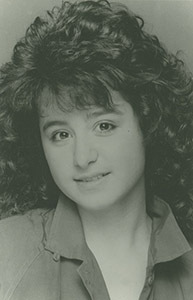 Nicole was born on October 28, 1967, and lived in Shrewsbury, Massachusetts. She attended Holy Name Central Catholic High School where she earned a variety of honors, including the Geometry, Art, Biology, Short Story and Humanities awards. She was active in musicals and also worked in set design for her school theater productions. Nicole was survived by her parents, Ron and Jeannine and a sister, Renee. She was also survived by her paternal grandmother, Juliette Boulanger. The Nicole Elise Boulanger Collection consists of one item: a writing by her friend, Cachelle Guadagnino, recounting memories of Nicole during her college years. Materials from this collection are also available as digital files. Please contact the archivist for more information on accessing these items. The Nicole Elise Boulanger Collection was donated by Cachelle Guadagnino in 2015, via digital deposit.